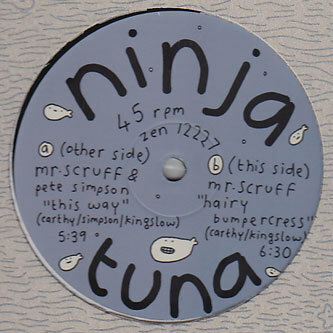 Squeezing out the remaining droplets of funk from his 'Ninja Tuna' long player, Mr Scruff plops 'This Way' and 'Hairy Bumpercress' onto a limited and heavyweight 180gm vinyl pressing. 'This Way' errs very closely to the tepid bloke-funk of Jamiroquai on the A-side, with a fine but cloying vocal from Pete Simpson, maybe it's just an acquired taste eh? 'Hairy Bumpercress' fares far better on the flipside with a dollop of classic Scruffian funk drums, bass and guitar made to liven up your night down't student's union.